Since the fermenter is now empty, it’s time to get it filled again. As a counterpoint to the coffee stout, I decided to brew a clone of Heavy Seas Gold Ale. Unfortunately, the recipe I had written down was not actually what I’d originally planned on when I worked out the specific gravity I should make, but the beer should come out good anyway. The brew day in short was pretty successful. For this brew I picked up a nylon bag instead of a muslin one, which I could let the grain float freely about in, wrapping the elastic mouth of the bag around the top of the kettle. I used 6 quarts of strike water heated to 160 degrees F to mash in my 4 pounds of grain. Once the grain was stirred in, the temperature dropped to 140. I heated the mash, but overshot my target 154 degrees F and hit 160. I added a little cold water and got to 152 and covered the kettle with the lid and a towel. Checking in on the temperature, I noticed that some spots were hotter than others, so I fiddled with it until I felt satisfied. I sparged with 7.5 quarts heated to 170 degrees F.
After nearly 48 hours of fermenting, the yeast are still very talkative, keeping Colleen up at night with their chatter. After the boil I moved the kettle into the sink. This time I didn’t top off with cooled water but rather just let the wort cool in the ice water bath. Once it was down to about 100 degrees F, I moved it into the fermenter and topped it off to 5 gallons at 64 degrees. The OG measured 1.057, whereas I was expecting about 1.045. Like I said, I goofed on the recipe. Then again, the Cascade hops I got were about 2% higher in alpha acids than when I planned the recipe, so maybe the extra malt will help counterbalance the extra bitterness. I rehydrated the yeast in 80 degree F pre-boiled water, slowly added the wort from the hydrometer reading into the yeast, and then pitched it. I affixed my blowoff tube to the fermenter and covered it with a cold damp towel. 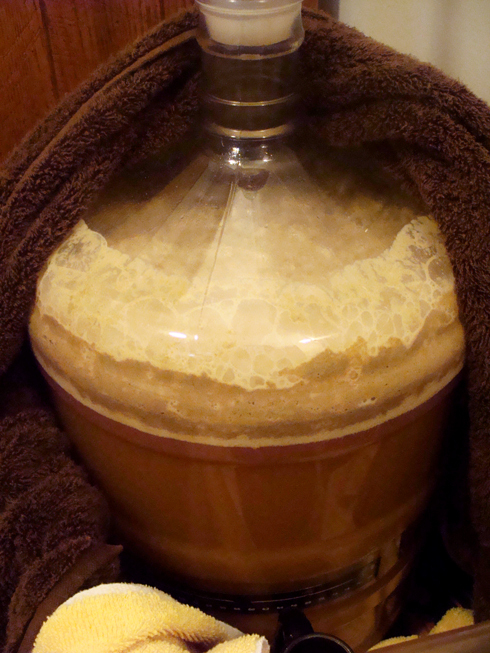 About 7 hours later a krausen was starting to develop, and the temperature on the fermenter had risen to about 68 degrees. What makes this brew day extra interesting is once I was done with the mash, I spread as much of the spent grain over two cookie sheets as I could in a layer a bit less than a centimeter thick. I put it into the oven at 200 degrees, and after about 20 or 30 minutes flipped the grains over with a spatula. In another half hour I turned off the oven so they wouldn’t start toasting. I didn’t have time to put them away after brewing, but once I was back to the apartment I set aside 1 cup of the grains and put the rest into plastic containers that went into the freezer. That cup I set aside was destined for a recipe that had been on my mind for at least a month. 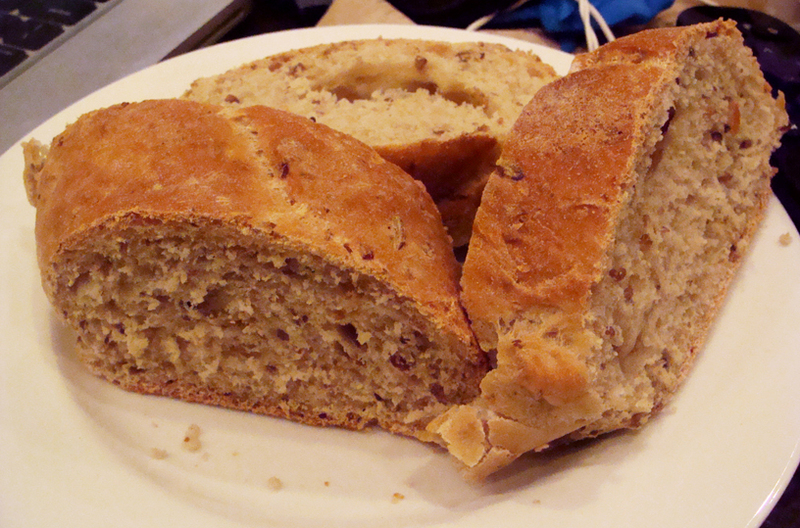 Some homebrewers and bakers have realized that spent malt makes for great bread. I used this recipe for guidance, using a little less oil and two tablespoons of honey instead of agave syrup. After mixing the grain, flour, salt together in a large bowl, I proofed the yeast in 1.25 cups of warm water along with the honey and oil. Once the yeast was bubbling I dumped it into the dry ingredients. I found that 1.25 cups of water wasn’t quite enough, and added about another eighth cup of water to get the dough to a consistency I liked. After kneading the dough for awhile, I lifted it out of the bowl, oiled the bowl, replaced the dough, and covered it to rise for a couple hours. Once it had risen, I tore it in half and rolled it out on a flour baking sheet int oa sort of flat rectangle. I then folded a third of the rectangle lengthwise towards the middle and another third on top of that. I then sort of tucked/smushed the ends onto this seam and smacked it a couple times to get it to stick there. I smoothed flour over the whole loaf with my hands. I then covered these two loafs and let them rise for another hour. As is recommended in the recipe, I preheated the oven to 410, and once the oven was ready I slid the baking sheet with the loaves into the bottom rack, through a handful of ice onto the oven floor, and shut it up. I have read some warnings that cold vapor and condensation could possibly crack the glass of an oven door, but I didn’t have an issue. Use your discretion. 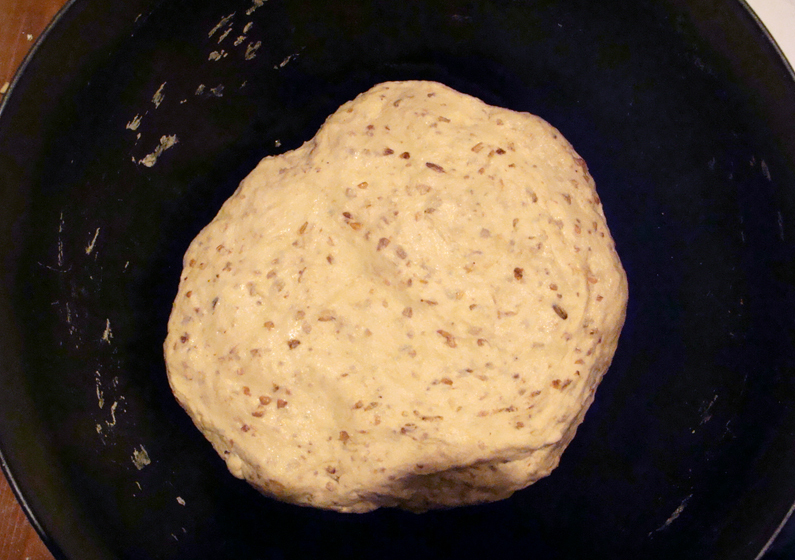 Once the bread has developed a brown crust (brown – not pale brown), it’s ready to come out of the oven. Give your loaves a thump on the bottom with your finger and listen to it. If it sounds sort of thuddy and hollow, your bread is done. Cut it open! Hopefully it looks delicious. Hopefully it is delicious. Mine was terrific, and I sure am glad I’ve got quite a few cups of grains in the freezer to make more. 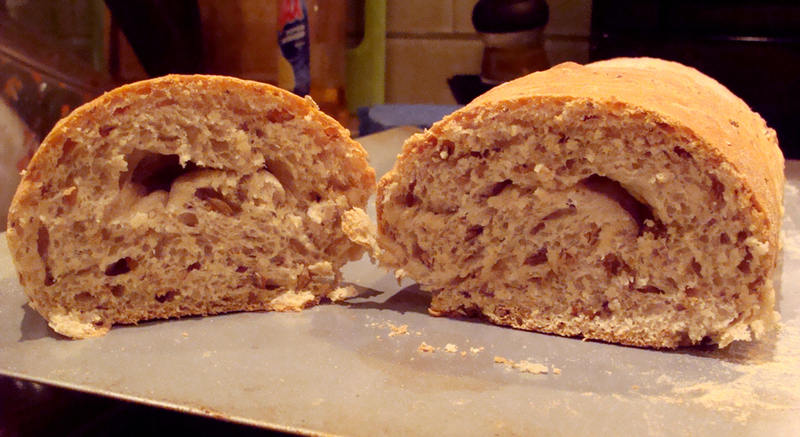 This entry was posted in beer, brew day, recipes and tagged beer bread, bread, dough, gold ale, golden ale, heavy seas, spent grain on March 12, 2013 by Dylan Bargteil.